Look at me! Watch this! What's that? I want that one! These are all examples of common childhood communications. Whether in the form of words, gestures, or combinations of gestures and words or gestures and sounds, our children want our attention. We want their attention too. As parents we are constantly saying, "get the___", "where is ____?" These examples require a skill called joint attention. What happens if that skill is delayed? When the skill is delayed, parents often report that the child will cry when something is wrong, but she doesn’t make attempts to tell or show you what they want. So, when should joint attention develop? 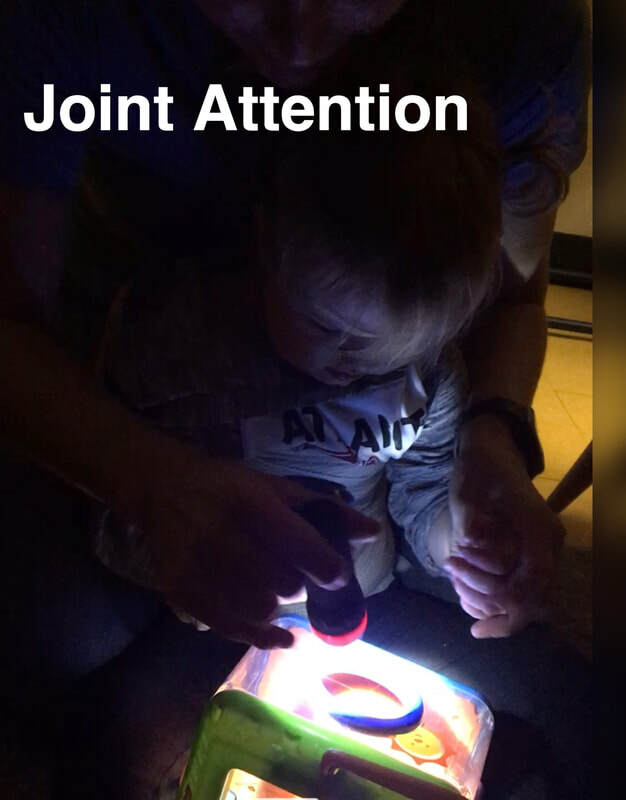 Joint attention develops as a child approaches toddlerhood. You will see them stop and turn when you say their name. They will look when you point at something. They will begin gesturing to get your attention. Of course every child is different and some are more independent than others. Just remember that Interaction leads to listening. Listening leads to understanding language. Understanding language leads to using language. So, encourage that independent soul to engage. 1. Sit eye level with your little one when you play. 2. 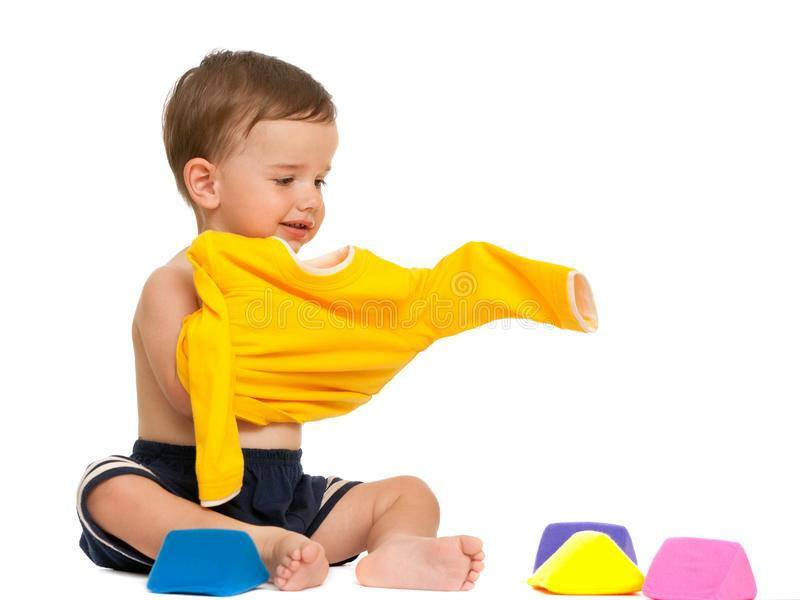 Use interesting objects to capture a distracted toddler’s attention. 3. Frequently model gestures, such as pointing and showing items as nonverbal ways of communicating. 5. Explore objects that have a different smell, texture, or taste. 6. Hide and find objects in sand, rice, under cups or blankets. Do you have trouble getting your child to follow a regular schedule? Consistent routines and rules help create order and structure your day. 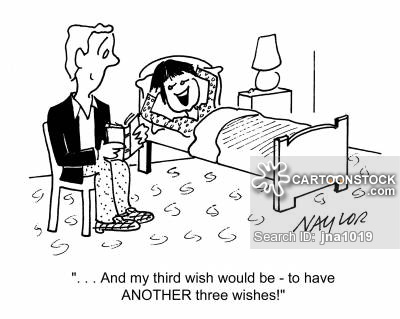 Things go more smoothly when you and your child know what to expect. In addition, the predictability provides ample opportunity to learn to communicate. Consistency, predictability, and follow-through are important for language learning. When you respond to your child’s behavior in a predictable manner, they learn the desired behaviors and the associated language scripts. When you are consistent, the behaviors you like will happen more often. Routines and daily schedules help you and your child. You both know what to expect each day. 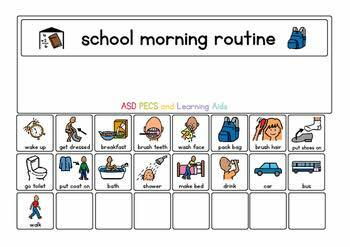 Routines can also improve your child’s language and communication through the use of predictable scripts during routine activities. A novel addition to the routine is an opportunity to learn new vocabulary and behaviors. So, don't feel like military precision is the goal! Keep things positive! Reward and praise your child for following routines and rules. Language rich praise provides behavior reinforcement while exposing your child to new vocabulary when you describe the behavior. Focus on describing your child’s good behaviors. Unless an undesired behavior is dangerous, try and extinguish it by ignoring it. Most of us know the story of the little engine that could. The moral of the story is task persistence. 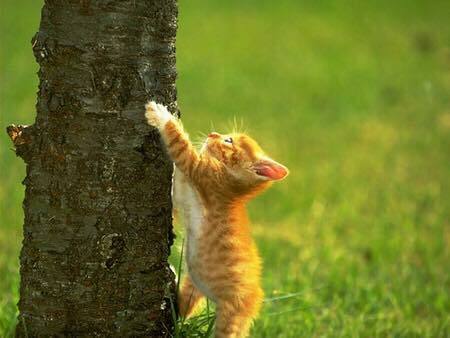 It’s easy to preach task persistence when the end is in sight and the goal is highly desired. It’s not so easy when we are pushed out of our comfort zone and success is not clearly defined. So what does this mean for parents? If you know your child can achieve a task if she tries hard, it might be worth modeling effort and success for her first. Parents don’t have to make things look easy all of the time. The next time you struggle to achieve a goal, it’s OK to let your child see you sweat and keep trying. We can also directly teach the concept. When your child is challenged and wants to walk away, encourage task persistence by praising one more try, one more turn, or one more page. Next time, it can be two more. 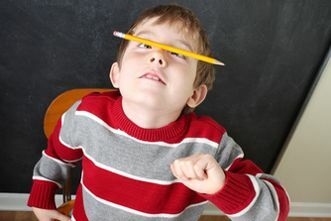 How do you handle task persistence and challenging tasks in your house? 1. Body parts for vocabulary and body awareness. 2. Clothing items for vocabulary and object use. 3. Colors for vocabulary, matching, and sorting. 4. Following directions: Single step: Get your shoes; 2 step: put on your shirt and pants. 5. Answering questions: "where are your shoes?" 6. Choices for engagement and interaction. Do you have any other ideas? Please share. As parents, we want to have a happy and peaceful family life. The ability to handle negative emotions and the fact that things aren’t always easy is key for that goal. So, next time your child gets upset when things don’t go his way, allow him to be upset. Don’t try to fix it. Just, calmly say, “ I see you’re upset because—. It’s ok to feel frustrated.” If the negative emotions escalate, allow a cool off time. You can say, “I see you’re upset. I’ll give you a few minutes to calm down.” Then, let them self-soothe. If, they are destructive or combative, then they’ve earned a time out. It’s ok to be upset. It’s not ok to hit or throw things. Choose your battles. But, when you chose it, win. Ok, easier said than done. But, let me give a manageable example: You want your child to follow simple directions in the daily routine. However, you often find you’re either repeating yourself until you’re angry or just doing it yourself. This common struggle is actually a learning opportunity. It can start simply. You say, “5 more minutes of TV. Then, it’s time to read a book.” Demonstrate you mean it by setting the timer when you say it. (There is a handy timer on your smartphone) When the timer goes off, prompt your child to turn off the TV. If they don’t, then you walk over and do it yourself. No discussion. You just taught your child to respect boundaries, anticipate future events,and follow directions. You are also teaching time concepts including time management. If they are upset, it’s ok. Use words to acknowledge their frustration or disappointment by providing the vocabulary and a strategy to self-soothe. Example, “I see you’re frustrated that it’s time to turn off the television. It’s ok to be frustrated. Why don’t you take a deep breath and choose a book in your room.” If they need assistance with the transition, a choice of books may be helpful. The bonus learning opportunity is emotional control, vocabulary, and the ability to self-soothe. Please share any simple strategies that work in your home. The day can be a day of fun and celebration. But, it can be scary and overwhelming if you don't know what to expect and how to handle it. I am attaching a link to a social story that can be used to prepare your family for the festivities. 2. blocks: building or clean up. 3. coins in a piggy bank. These activities are language rich opportunities to follow directions and learn vocabulary with labels, colors, textures, prepositions, and more.